The first medals of the 2018 FEI World Equestrian Games in Tryon, North Carolina, have been decided, with the team competitions for dressage and reining completed. Germany was crowned the winning team on a score of 242.950. The United States took silver on 233.136, while Great Britain earned bronze (229.628). 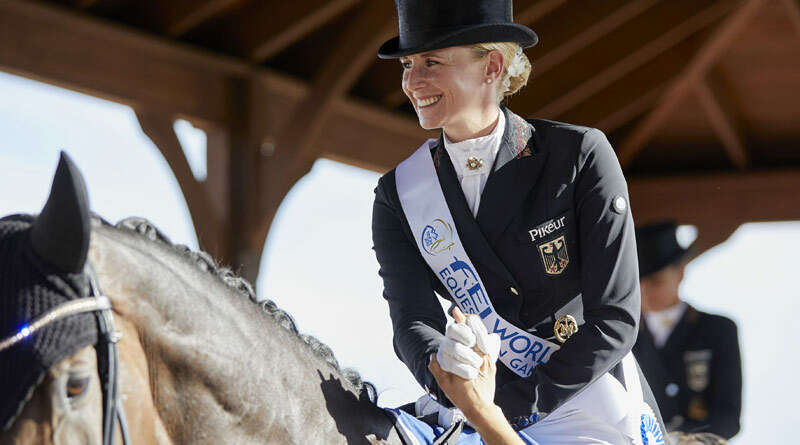 Germany’s Isabelle Werth topped the individual standings with Bella Rose on a score of 84.829%, with teammate Sonke Rothenberger riding Cosmo finishing third behind the USA’s Laura Graves with Verdades. Sweden’s Patrik Kittel came very close to putting his team into the bronze position, but it wasn’t quite enough. And when Graves and Verdades produced the second-best mark of the day, 81.537, the British had to settle for bronze. But Carl Hester (Hawtins Delicato), Charlotte Dujardin (Mount St John Freestyle), Emile Faurie (Dono di Maggio) and Spencer Wilton (Super Nova ll) were pleased with what they achieved with three exciting young horses on their team. USA took out the team competition for the fifth consecutive time, with the country’s youngest WEG rider, Cade McCutcheon, leading the way Custom Made Gun, a 7-year-old stallion owned by his grandparents, Tim and Colleen McQuay. He was joined on the winning team by Casey Deary riding Hilldale Farm’s Heavy Duty Chex; Daniel Huss riding MS Dreamy; and Jordan Larson aboard Arc Gunnabeabigstar. Belgium took out the silver, led by anchor rider Bernard Fonck aboard What A Wave, joined by Ann Fonck on Made In Walla, Dries Verschuren with Smart N Sparkin, and Cira Baeck on Gunners Snappy Chic. Germany claimed the bronze medal thanks to Grischa Ludwig and Ruf Lil Diamond, Markus Suechling and Spotlight Charly, Robin Schoeller and Wimpy Kaweah and Julia Schumacher riding Coeurs Little Tyke. Austria was only half a point away from the podium. The Team Competition and the first qualifier of the Individual Competition kept reining fans glued to their seats. The top 15 riders will automatically will make their way to the Individual Competition. The top five riders from the second qualifier which will be held on Thursday, will also earn their chance to slide to the podium.